Cynthia Boiter is a six-time winner of the South Carolina Fiction Project, a three time winner of the Piccolo Fiction Open, a division of the Spoleto Festival in Charleston, South Carolina, a two-time fellow with the South Carolina Academy of Authors, the winner of the Porter Fleming Award for fiction and the W. W. Norton Flash Fiction Award. Her work has appeared nationally and internationally in Woman’s Day, Family Circle, Southern Living, Parents Magazine, Parenting, Expecting, Sandlapper, and more. 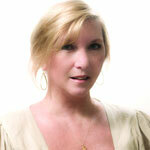 She is the former editor of undefined Magazine and the founder and editor of Jasper Magazine. She is an adjunct instructor in Women’s and Gender Studies as well as Sociology at the University of South Carolina. A dedicated arts activist and grass roots organizer, Boiter is the proud mother of two grown daughters. She lives in Chapin, South Carolina with her husband, Dr. Robert Jolley. Cynthia Boiter’s Buttered Biscuits is a collection of award-winning short stories written by an artist with an ear for Southern speech and an eye for Southern culture. There are 14 stories in this collection, 12 of which have won prizes ranging from the South Carolina Fiction Project to the Piccolo Fiction Open, a division of the Spoleto Arts Festival in Charleston, South Carolina to a W. W. Norton-sponsored flash fiction competition and beyond. With a keen eye toward gender roles and family dynamics, Boiter writes about characters that are as grounded in their sense of place as they are committed to integrity, fidelity, and intellectual veracity. The short stories in this collection share the narratives of smart Southerners as they address issues of love and tradition, birth and death, growing up and growing old with an underlying, but unobtrusive sociological analysis. Whether the relationships explored are those of mother and daughter, father and son, husband and wife, daughter and gender-confused father, or nephew and dead-and-closeted-gay uncle, they are approached with a kind of honesty and intimacy that demonstrates what happens when good people demand the best of one another, even under conditions in which the best is the least likely behavior to expect. Most importantly, Buttered Biscuits brings to light an unexpected brand of Southern feminism and gynocentrism and an intense sense of honor and social justice in characters that live and die in a part of the country where these traits are often assumed non-existent. 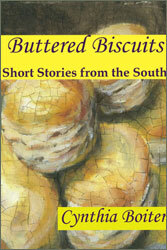 The cover of Buttered Biscuits: Short Stories from the South is taken from a painting by Thomas Crouch commissioned by the author. Thomas Crouch is a South Carolina artist who studied at the Lorenzo De Medici School of Art in Florence, Italy and the University of South Carolina. His work is represented in galleries throughout the United States and Europe. Crouch’s figurative work has explored politics, animals and their places within human society, and the prospect of figuratively putting animals in human spaces. This is his first painting of biscuits. The following stories were originally published as winners of the South Carolina Fiction Project and appeared in The Post and Courier, Charleston, South Carolina between 1993 and 2008: “Mary Anne” as “The Proposal,” “Aunt Priss” as “Aunt Priss and the Deer,” “Precious,” “Alvie and Alvin” as “Shoes,” “Momma” as “Lemon Verbena,” and “Desport” as “Softly and Tenderly.” The South Carolina Fiction Project is sponsored by the South Carolina Arts Commission which receives support from the National Endowment for the Arts.